This program is ideal for those looking to inherit a nearly complete system of fighting and culture. Our Masters Program builds upon the foundation you built in Guerrilla Boxing by introducing more advanced level fighting and self-defense; Qi Gong; Wooden Dummy training; weaponry; Massage Therapy and theories revolving around Chinese medicine and the 5 Elements of Wood, Earth, Water, Fire and Wood. The diversity and level of depth makes it a lot of fun. Simo Linh practicing a technique from 18 Luo Han Qi Gong. Living in San Diego, there is no shortage of great ways to get in better shape. We believe you should learn a viable skill while getting in shape. Effective street self-defense is a valuable skill and why not get in better shape while learning this? A lot of the movements you find in other forms of exercise can be traced back to Kung Fu as it has been around for many centuries. Many concepts you hear in sports or Personal Training have already been in Kung Fu for a much longer period of time. You no longer need to go to different places to learn different forms of self-defense or fitness when our training already has it. There are no magical moves but there is certainly a magical way to move. From effective self-defense to isometric and plyometric movements that build you from the inside out, no activity or sport can rival Kung Fu in its completeness.Visit our Registration Page. Self-defense does not take years and years to learn. What keeps a student long term in any martial arts style is diversity of training; how rare the subject matter being taught is; and the environment. Since our inception in 2009, Three Treasures Cultural Arts Society has become one of the most trusted names for quality traditional Kung Fu and Lion Dance in San Diego because of Sifu Frank's relentless pursuit of seeking higher level knowledge. Because of this, Three Treasures has Kung Fu for people training for fun and for those seeking mastery. The diversity of our training coupled with our many events throughout the year make your Three Treasures experience special and one of a kind. Click here to read more about Sifu Frank's martial arts background. We are conveniently located by the 15 freeway in Mira Mesa by Miramar Road at 9535 Kearny Villa Road Suite 104. Our location is broken up into 3 spaces: a fitness gym, a Kung Fu school, and our headquarters where our cultural, dance, music, and language classes take place. This is a brief overview of how students progress in our system. There are 5 levels to get to Black Sash which means you have an adequate understanding of the basics of the theories we teach. Levels are Snake (White), Crane, (Yellow), Leopard (Blue), Tiger (Red), and Dragon (Black). New students have the 1st levels to show us their character before we move anyone to Leopard and above. Candidates for assistant instructors are chosen from the Blue sash and above pool of students. Each level builds on top of the previous. Students progress at their own pace and move up in level after demonstrating proficiency at each stage. Each sash level encompass techniques from one of these categories: striking, kicking, joint locking, throws, internal (Qi Gong or Tai Chi), a Kung Fu form, ground fighting* (Three Treasures instructors only), and a weapon. Red and Black Sash levels are curriculum from Grandmaster Raymond Wong's systems of Tai Chi Praying Mantis, Do Gar, and My Jong Lo Han as well as Yang and Chen Tai Chi. *Our BJJ program is for Three Treasures instructors only as they have been accepted by Stronghold Jiut Jitsu and Professor Michael Cusi for personal lessons. We do teach basics to our students so they are familiar with the postures and positions but anyone looking to learn only BJJ should enroll at Stronghold or another dedicated BJJ school to receive the full curriculum. Form: Proper form is key to unlocking natural power and protecting your joints and ligaments. It also unlocks the application that each technique was intended for. You will benefit from our understanding of Chinese medicine and Massage Therapy which both lead to improved structural integration. Function: One of the best parts of Kung Fu's legacy is its applications. Our training is 100% hands on and you do not move forward until you have a firm understanding of what each technique is for and how to apply it. We do not teach magical moves but there is a magical way to move. It is important that your self-confidence comes from knowing your Kung Fu actually works. Power: This follows good form. In Kung Fu, power is often referred to as jing, which is generated through breath and combining the power your entire body into your strike or kick. 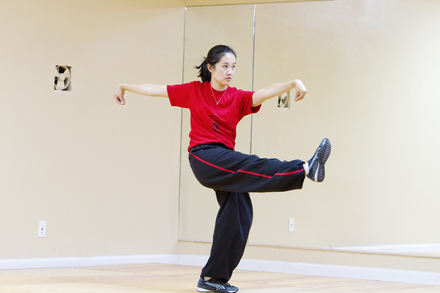 You learn pre-set routines called forms, or kuen in Cantonese, to teach your body how to move properly. These forms serve as your encyclopedia of knowledge. Through repetition over time, your power will improve. Without power, your Kung Fu cannot reach its full potential or come to life. Without power, it is difficult to exert enough force to stop a larger and stronger opponent. There are no weight classes or sparring gear to protect you on the streets. Furthermore, one of the unique aspects of our system is our focus on pressure point striking which is enhanced when you apply the right amount of power. For this reason, we do not train with boxing gloves. Philosophy: Your character and intentions are what determine how far you will go as a martial artist and as a person. As a non-profit, we do not discriminate on the basis of anything but if we accept you as a student you are expected to follow our Code of Ethics and Martial Virtues. We are not teaching you dangerous techniques so you can bully others or misuse Kung Fu for your personal gain. Three Treasures is a high integrity organization that follows the original meaning of what Kung Fu Martial Virtue was meant for.